Space: Any place where lots of people can drink and party. A few tables (simular to a ping pong size table) would be ideal to set up the game and play on. Any tables will work but the closest to a ping pong size table is best. Description: This is a fun drinking game/workshop. It is usually played on a ping pong ball table with a ping pong. I will go over all rules at the workshop but here is a basic outline of the game (kind of hard to explain but it's really easy to learn); 2 people on a team. 2 teams play against each other. 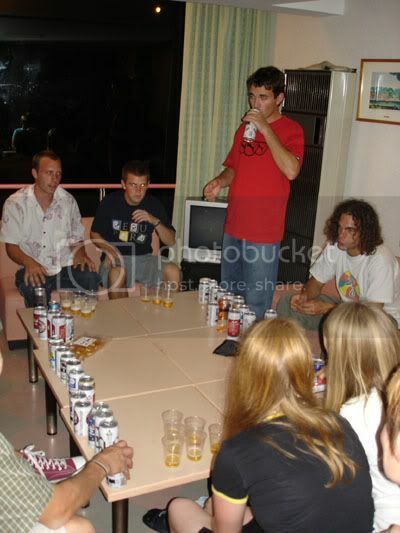 Set-up requires each person to put a little bit of beer in ten plastic cups. They then put those 10 cups in a bowling pin configuration in front of them on the table. Each team gets one ping pong ball. The object of the game is to bounce or throw the ball into the other teams cups. When you make one in, they have to drink that cup and set it aside. To win you must get the ball in all of the other teams cups (20 total). There are more little rules but that is the basics. We played this at the last Unicon and it seemed like a big hit. We play it a decent amount here in Minnesota so practice up guys and girls!! Who should attend: Anyone that likes to drink, party and have a good time. What to bring: EVERYONE needs to bring their own beer. I would suggest bringing at least 6 cans of beer per person just for the game so bring extra if you want to drink while watching others. It is never any fun when you run out of beer and can't play anymore! About the leader: Jamey Mossengren is a BEERsketball world champion. OK, maybe he isn't but he has held many titles for unicycling over the past 15 years he has been unicycling. He's from Minnesota (USA) and belongs to the Twin Cities Unicycle Club. Preferred Scheduling: At night, the date to be determined. Time conflicts to avoid: Avoid any really important events that are early the next morning. Some people may want to sleep in the following day. Special needs: A few tables (simular to a ping pong size table) would be ideal to set up the game and play on. Any tables will work but the closest to a ping pong size table is best. 5 would be a good amount but would take whatever we can get. Chairs would be nice for people to sit down. I will try and bring ping pong balls and plastic cups (bigger the better) or buy them there (does anyone know if there is a place to buy ping pong balls and plastic cups in Langethall)? Comments: Let me know what you think! We will have a sign up sheet at Unicon.....should be a blast. yea, thats me with a goat. man, for that alone i would go to unicon! i hope you have a good turnout for this jamey! you should talk to connie about getting this in the TCUC uni weekend that we are having in may! good prep for those who don't know how to play it. plus it will be good to have a test before you take the game worldwide. You can buy ping pong balls at Ochsner Sports in Langenthal, plastic cups and beer are available in any supermarket (beer only if you are older than 16, spirits only if you are older than 18). I think there are outdoor ping pong tables around. I'll check. I unicycle, therefore I am. I'll bet you a beer that this doesn't show up in one of Ryan's updates. how about.. get drunk and try to uni ? No thanks, I think you have a safe bet! They actually had some type of thing like this at the final party in China. I never played so I don't know the rules and stuff but it basically was something like you had to do a trick and then drink or drink if you fall or something...anyone here participate in it? I don't know if it was related to this event but that same night at the final party, Julien Monue from Switzerland had a few too many and tried to do a trick, fell and had to go to the hospital to get stiches! Anyone want to come up with a game/workshop that involves drinking and unicycling for this Unicon? Looking forward to this event. Here's a pic. from the unicon 12. beersketball event. They actually had some type of thing like this at the final party in China. I never played so I don't know the rules and stuff but it basically was something like you had to do a trick and then drink or drink if you fall or something...anyone here participate in it? Oh yes, that was afun game, I remeber the start of it, but the end is a little hazy. one had to nomiate the hardest trick you could do, do it then drink, then do it again, till you fell off. As you say JM fell doimng some crazy hard thing. The game was won by the muni rider whos best skill was free mounting or ideling or some such Actully Ithink his best skill may have been beer drinking.Nathan, was it you? or was it Bruce Bundy? I'm planning on having the practice round on Monday the 24th and the tournament on Monday the 31st starting at like 22:00 both nights. Let the party begin!!! Hi Sarah. I'm looking forward to seeing you next week. You and Paul look very happy in the photo you posted. In China, it was officially called the "Beer Drinking Workshop". Due to injuries sustained, there won't be any more of these that are official though. Anyway, the rules were pretty simple. You had to pick in advance a trick that you could do, not your hardest, but something. Roger wrote them all down and then the competition began. Each person drinks a beer (I think they were about 8 or 10 oz) then demonstrates the trick to Roger who records it. Repeat until you can't perform the trick. For some people, that was really quick. I remember one person whose trick was sideways coasting - I think he lasted one round. Then Roger made a mistake. He permitted a trick-change. So the unnamed person (not JM) picked an easier trick that lasted a few rounds more. By round 10 or so, he was reduced to having his trick be "free mount". And failed. It was SO funny. I think everyone else stuck with their trick all the way though. The eventual winner was Bruce Bundy from Santa Cruz, California. He did his kick-up mount after 20 beers. Leo White from England was second with 18 but I forgot his trick. I managed to one-foot idle 10 times after 16 beers for 3rd place. But the catch was that at approx round 10 or 12, the rules were changed and in addition to another beer we had to take swigs of an amazingly bad Chinese liquor, directly out of a plastic half-gallon jug. To this day I still have an aversion to clear liquor that smells like that. What a night. It was SO funny walking back to the hotel afterwards. People falling down, trying to ride. I almost died laughing. The downside was injuries that required a scary trip to a Chinese hospital for stiches. That was not so great. I really encourage responsible drinking!